Turns ordinary hearing into extraordinary hearing! What can you do when it&apos;s hard to hear but you don&apos;t want to miss hearing a word? Now, you can get Loud N Clear, the personal sound amplifier that looks just like a cell phone headset, but can help you hear every word loud and clear. With Loud N Clear, you&apos;ll never miss another word at lectures, movies, shows or church. So powerful, you can even hear conversations from across the street. Perfect for listening to TV without disturbing others. Comfortably fits either ear. Requires 2 button cell batteries (included FREE). 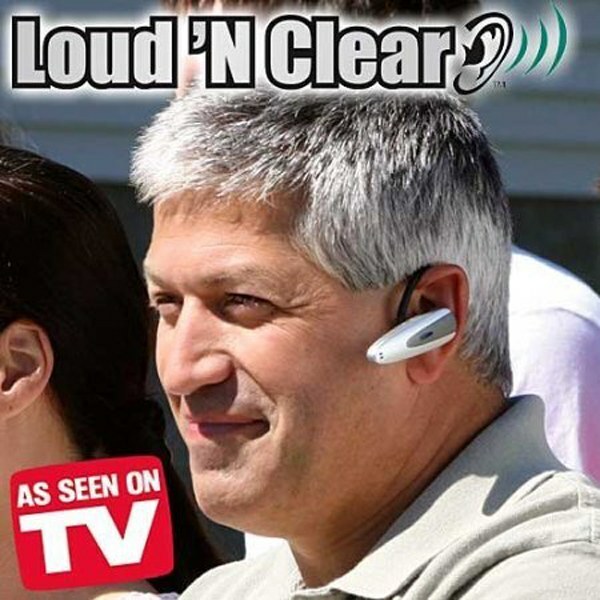 3-1/2"L.
Loud N Clear provides sound amplification while cleverly disguised as a Bluetooth headset. Turn up the volume and listen at any level - without disturbing others. No cords or extra earphones needed. Great to use at the theater, church, movies and more. An easy and affordable way to get back into the conversation.